Aging, there’s no way to avoid it. But there are many ways that we can mitigate its negative effects. In this article, our friends at GMB discuss aging, the effects it has on us physically, and what we can do about it. A good read for anybody of any age! Veganism is becoming more and more popular these days. Understandably so, as people are becoming increasingly concerned about the impact of Intensively farmed meat and dairy’s toll on the environment. However, in this article, farmer Isabella Tree discusses the potential negative implications that veganism can have on the sustainability of our farmland, as well as our health. This article is a great read no matter which side of the debate you may stand on. Neurokinetic Therapy. If you’ve been to see us at Backs Etc., you’ve probably heard this phrase. NKT, as it’s known for short, is an innovative technique which utilises manual muscle testing to assess dysfunctions in the coordination system of the brain that can result from injury, postural stress or poor movement patterns. It cues the brain for new learning resulting in immediate correction of neuromuscular imbalances. NKT addresses pain at its source: the motor control centre of the brain. In this article, renowned functional medicine practitioner Dr. Josh Axe discusses the technique, its history, and how it’s personally helped him recover from a lower back injury. ‘Eat a balanced diet’. ‘Ensure a good work-life balance’. Balance your budget’. Notice a trend here? Balance seems to be considered a pretty important thing. Indeed it is, and perhaps nowhere as important as its role within our bodies. Without it, many of our basic motor functions get pretty damn difficult. Just ask anyone who’s suffered from Labyrinthitis, Benign Paroxysmal Positional Vertigo or Ménière’s Disease. But even without suffering from one of those disorders, many of us struggle with poor balance. Our ability to balance is a combination of sight, vestibular (ear canals) and proprioception (our body’s ability to know where it is in space, even with our eyes closed). As we get older, our proprioceptive and vestibular systems decline, along with reflexes and coordination, resulting in diminished balance control. This is why so many elderly people fall down and break their hips or other bones. And that is one slippery slope we’d like to avoid! So how to do that? Train your balance and coordination of course. The trusty old phrase ‘use it or lose it!’ applies here, I’m afraid. But the good news is that there are far more fun ways to train your balance than just standing on one foot. The brilliant folks at GMB recommend a programme consisting of jump spins, walking around with eyes closed (but shins beware! ), as well as more advanced hand balancing techniques. Here at Backs Etc., our training programmes often contain floor-based exercises that require a degree of balance control, as well as balance-challenging resistance exercises like single leg deadlifts and Bulgarian split squats. But one great tool that we’ve only recently started using is the slackline. Similar to a tightrope, the slackline is stretched between two trees or other anchor points with the aim being to balance and walk along it. Unlike a tightrope, though, the slackline is a flat webbing, usually around 2 inches wide, making it easier to learn than a traditional tightrope. As the name implies, the slackline is not tensioned as tight as a tightrope. Because of this, the line moves up and down and side to side as you walk on it. The real skill then is to anticipate these slight movements of the line and move your body to compensate for them, improving your balance and core strength. Anybody first attempting to balance on a slackline will experience a violent shuddering back and forth of the line. This is due to the brain trying frantically to overcorrect the sideways motion of the line. This is similar to the way a driver may oversteer the opposite direction when skidding, causing a car to spin out of control. Fortunately, slacklining is much safer than driving! So, besides improving our motor control and balance, what are some of the other benefits of slacklining? It’s a full body workout. I mentioned core strength earlier, but slacklining requires the complete use of your entire body, engaging all your muscles and focus to prevent you from falling off the line. It can boost memory function. 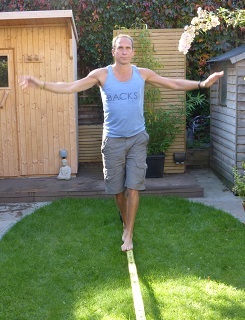 A 2011 study in the scientific journal Hippocampus said, “slacklining led to an increase in the structural and functional plasticity of the hippocampus, an area of the brain responsible for navigation and memory”. It can improve your posture, help you jump higher, and improve lower-limb rehabilitation. It’s inexpensive. You can buy a good quality slackline for £30-£40. It’s portable. Take it to the park and stretch it between two trees. It’s worth noting that slacklining is pretty challenging. I’ve been using ours for about a month or so and I’m still pretty bad. But I notice little improvements regularly, and that feels nice. It’s also encouraging knowing that every time I step on it, I’m making positive changes for my body and mind. Being a slacker has never felt so good! In this article, Chris Kresser breaks down the arguments, and in the process, points out many of the shortcomings of the study. Read the full article, Will a Low-Carb Diet Shorten Your Life? The get-up, sometimes referred to as the Turkish get-up is one of the most effective full-body resistance exercises one can do. A few years ago it was all the rage. Lately, for some reason, it seems to have fallen a little out of favour. In this article from StrongFirst, the author discusses how get-ups are a natural evolution from crawling, another form of exercise that has become hugely popular of late (and for good reason!). Both crawling and get-ups can be extremely beneficial for strength, stability and mobility, as well as for the vestibular, visual and proprioceptive systems. At Backs Etc, we often work with clients on both of these outstanding exercises. get in touch if you’d like to learn how to add these to your training programme. The Reliability of Diagnostic Imaging Without Clinical Correlation In Musculoskeletal Medicine: An Evidence-based Review. A summary of the evidence on the reliability of scans for musculoskeletal issues, showing that in most cases there are just any many people with structural issues that don’t have pain and dysfunction. It’s not how it looks, but how it works that is important, that’s why at Backs Etc we focus on improving movement patterns. Read the article, The Reliability of Diagnostic Imaging Without Clinical Correlation In Musculoskeletal Medicine: An Evidence-based Review. I recently spent a weekend in the Midlands on the floor rocking, rolling and crawling. No, I wasn’t just suffering from too many pints of lager. Rather I was participating in two workshops, Pressing Reset and Becoming Bulletproof run by the folks at Original Strength. OS describe themselves as ‘a human movement education company teaching health and fitness professionals around the world to Press RESET. By teaching how to help people move the way we were designed to move, we can help them restore reflexive strength and stability. When we have our reflexive strength, we have a solid foundation enabling us to live life better.’ What this entails is going back to how we originally developed our strength and motor control as babies and young children, teaching our adult minds and bodies how to reset poor motor patterns and allow us to perform physically (and mentally) as we should be able to. Tim Anderson, one of the founders of OS, is someone whose videos I have watched on YouTube for a couple of years now, so I was pleased that he was running the course. He is a warm, passionate instructor with a gentle southern drawl, and made the weekend extremely enjoyable and informative. He began by introducing the concept of reflexive strength, one of the key components of the system. He describes this as the body’s ability to anticipate and respond to movement before and as it happens and stability and mobility in harmony with one another. The focus of the first day’s workshop is what Tim refers to as ‘pressing reset’, essentially engaging the original operating system preprogrammed inside every individual’s nervous system. Engaging this can be likened to pressing the reset button on a video game, rebooting (or refreshing) the central nervous system to build new neural connections, restore old ones, and make existing ones more efficient. The result is a healthier brain and nervous system which leads to a healthier body able to utilise the mobility, stability and strength it is designed for. Those of you familiar with the work we do at Backs Etc will know that we already incorporate these into our therapy and training programmes, so this course was a natural fit for me. Proper breathing is where it all begins as, without a stable core, our brains will not allow our bodies to achieve the stability and mobility they are capable of, so the initial portion of the workshop is focused on developing good nasal diaphragmatic breathing techniques in a variety of positions. We then moved on to the oh-so-important vestibular system. The OS system focuses on mastering head control to reset and strengthen this, so we did a number of head flexion, extension and rotational exercises, again in a variety of positions, supine, prone and quadruped. The third big reset, rolling, is a fun one. Rolling is the beginning of the human gait cycle, and helps connecting the opposite shoulders to the opposite hips. There is also a lot of head control involved, bringing the vestibular system into the equation. There are a variety of different rolling patterns, some forward to back, but most moving laterally, driven by either the upper or lower body. Then it was time to rock out. Rocking on hands and knees is a primal movement pattern that helps children build strength, mobility and posture. By modifying foot position we can also use rocking to improve our ankle mobility, or start on our elbows instead of hands to further mobilise the thoracic spine and build upper body strength. The last big reset, which ultimately ties everything together, is crawling. There are a myriad of variations of crawling, all effective in improving contralateral coordination, developing neural connections and building strength. We started with variations on the classic dying bug and bird dog exercises, progressing to commando crawling, hands and knees crawling, and ultimately leopard crawling (sometimes referred to as bear crawling or beast crawling in other methods). People who haven’t tried crawling may not realise what a tremendous workout it can be. Crawling across the length of the gym floor as slow as we possibly could, for 5 minutes, left every participant in the workshop huffing, puffing and sweating profusely. I routinely train my clients to crawl in a box pattern (forwards, sideways, backward and sideways the other direction) for two minutes, which often feels like an entire workout compressed into a tiny period of time. Good stuff! The workshop on the second day, Becoming Bulletproof, was designed to take these resets we learned and advance them in ways that make them more fun, more challenging and incorporate various other fitness tools that we may have at our disposal. For instance, lifting one’s knees off the ground whilst rocking really fires up the lower body musculature and provides a great little full body workout. Variations on crawling including axis crawling, a brilliant exercise one can do in a hotel room, for instance, that requires no space or equipment; crawling sideways with the feet pressed up against a wall is an awesome core burner that again requires no equipment. If you do have access to some gym gear, you can try exercises such as crawling pulling a chain or kettlebell. We also played around with battling ropes and upside-down kettlebell carries, both tremendous workouts. One of the wackiest exercises we performed involved using a cup to scoop water out of one bucket and use it to fill another, all whilst holding a plank or elevated crawling position, showing that exercise does not need to be boring or mindless. In fact, putting play and fun into fitness was one of the big messages of this course. And fun it was. Hard, too! I had major DOMS (delayed onset muscle soreness) for days after the weekend, even in places that I don’t normally feel it. In conclusion, I found the OS training to be a great addition to the toolset we already use here at Backs Etc. We are huge supporters of what we call primal therapy and training in systems such as Original Strength, DNS, Animal Flow and Immaculate Dissection. If you’d like to learn more and/or start channeling your inner baby, get in touch. Let’s work together to help you reclaim your original strength! Ankle sprains can affect the way your nervous system controls movement long after they have healed structurally. At Backs Etc, we always take them into account, as they can be the underlying cause of your hip or back pain. Read the full article, The Long-Term Effects of Ankle Sprains. New research finds that children and adolescents who spend most of their time barefoot develop motor skills differently from those who habitually wear shoes. Published in Frontiers in Pediatrics, this is the first study to assess the relevance of growing up shod vs. barefoot on jumping, balancing and sprinting motor performance during different stages of childhood and adolescence. The study shows that habitually barefoot children are noticeably better at jumping and balancing compared to habitually shod children, particularly from 6-10 years of age. While these beneficial barefoot effects diminished in older adolescents, the research nevertheless highlights the importance of barefoot exercise for motor development as children grow and mature. Read the full article, Footwear Habits Influence Child and Adolescent Motor Skill Development.